The best red cow we have ever produced! One of the"Breed's Best"!! 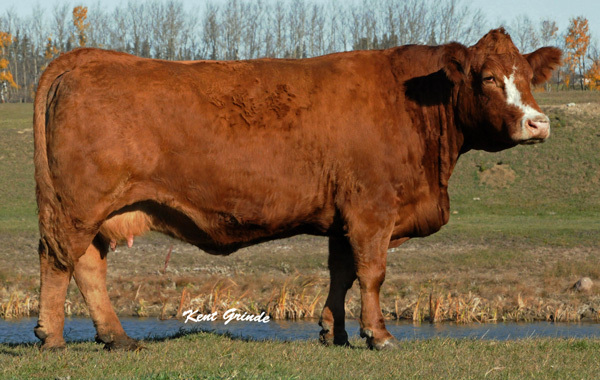 Genetically no accident--our 100 cow family with greats in the pedigree such as Extra, Galant, Lacombe Achilles, and the exceptional maternal bull Pasque. Great Fleckvieh blood such as Bold Leader, Siegried, Arnold's Image, CBII, and our German import matriarch Fraulein. Red Pearl is the perfect combination of performance, femininity, and complete soundness! 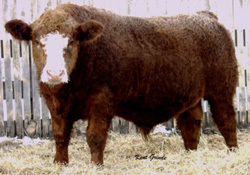 Daughter,IE 129U, has proved to be a high selling producer and has flushed 60#1 embryos in 2 flushes. In the breed's top 3% for WWT, and top 5% for MWWT!! !